Join us for the 19th Biennial Enology & Viticulture Conference at the Penticton Trade & Convention Centre. 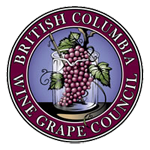 Early-bird Delegate registration will be available at the BC Grapegrowers' Association Grower Day on April 4 at the Penticton, Lakeside Resort. Agenda and complete details coming soon to this site. Contact Executive Director, Kate Durisek info@bcwgc.org | phone: 250.809.7107 for more information and to discuss volunteer and/or exhibitor opportunities.